Embroiderers' Association of Canada, Inc.: Are you Ready for the EAC ATC Swap? Are you Ready for the EAC ATC Swap? The deadline for the next EAC ATC Swap is April 1st, which is fast approaching! Are you ready to take part? 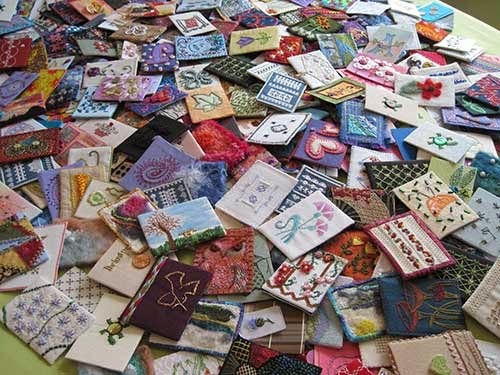 You have to love ATCs (Artist Trading Cards) – especially stitched ones! They are the perfect opportunity to try just a bit of a different technique or stitch. Recently I have felt myself drawn to canvaswork. I had a piece of glitter canvas which was flower pounded – a sample from a class – so I decided it would be fun to try out some canvaswork on it. When I cut it up, it made six perfect ATC sized bits of canvas. Sometimes you have a tiny scrap of stitching left you can use for an ATC. I recently made some crazy quilt lids for wooden boxes from quilt blocks I had on hand and because the size of the boxes varied, there were pieces cut off and left over. What to do with the scaps? Make an ATC! ﻿A new technique or stitch is also a great place to start. The following ATCs were inspired by a magazine article of counted thread stitches with another thread woven through. I decided to experiment with variegated thread and metallic for the weaving. So, are you getting in on the fun of the exchange this year? It is open to all members of EAC so if you are a member why not take part! If you aren’t a member, why not? You are missing out on exchanges, challenges and more! You can find more information on the EAC ATC Exchange – and information on joining EAC if you aren’t already a member – on the EAC website. Great seeing all these atc's! I'm inspired and will definitely be participating.